Annabel is dead set on becoming a famous actress. When the camp play calls for auditions, she is only too happy to try out for the big part. Annabel clinches it with her blood-curdling screams, and she thinks this gig just might be her big break. But soon she learns there's more to the acting life than fame and fortune. And when a garden snake worms his way onstage opening night, it's up to Annabel to make sure that the show must go on! Annabel's ordeals will have readers laughing out loud and applauding wholeheartedly in this follow-up to Annabel the Actress Starring in Gorilla My Dreams, Annabel the Actress Starring in Just a Little Extra, and Annabel the Actress Starring in Hound of the Barkervilles. Annabel was an actress. She wasn't a star yet, but she planned to be one by the time she grew up. She practiced every day. She practiced feelings, like Angry or Joyful or Sad. She practiced characters, like Pitiful Orphan or Notorious Jewel Thief. But today Annabel wouldn't be practicing. Today she would be going to Camp Waverly for the Dramatic Arts. Four whole weeks of acting classes! With professional actors as her teachers! In a rustic woodland setting. Annabel didn't care much about the rustic woodland setting. But acting all day was her dream come true. When the camp bus stopped in front of her house, Annabel had been ready for an hour. She practically bounced up the bus steps. There were plenty of empty seats, but she thought she might seem stuck-up if she sat alone. So she sat down beside a boy with curly black hair. He was writing in a large notebook. "Hi," she said. "I'm Annabel." The boy looked up for a moment. "Orson," he said. "What are you writing?" Annabel asked. "A play." He bent over his notebook again. "Cool," Annabel said. "What's it called?" "The Genius," said Orson. "It's autobiographical." Annabel turned to look out the window. As they traveled along Route 70, she watched as the houses grew farther and farther apart. At last she saw a sign on the right side of the road. It was made of narrow logs, and it hung from two wooden posts. It said CAMP WAVERLY FOR THE DRAMATIC ARTS. The bus bumped down a dirt path and stopped in a small, gravel parking area. Two other buses were already there. Kids were spilling out of them and running around the parking lot. 0Her driver stopped and opened the bus door. Annabel practically exploded out of the bus. Camp Waverly was laid out around a large, grassy meadow. Four open tents with green and white canopies stood at the edges of the meadow. Some of the campers were already sitting on the grass in front of the biggest tent. Annabel and the other kids from her bus sat down behind them. Eight people were sitting on white folding chairs under the tent. Annabel guessed they were the drama teachers. A tall, white-haired woman stood up and cleared her throat. "Welcome to Camp Waverly," she said. Her voice was deep and loud. Annabel wondered if she had been an actress herself. "I am Brenda Waverly," she began. "Camp Waverly has been training young actors for thirty-one summers. Many of them have gone on to become successful performers." Annabel perked up. Maybe agents and producers and directors knew about Camp Waverly. Maybe some of them visited the camp every summer, looking for new talent! The campers were divided into three groups. Annabel and Orson were in the youngest group, the Beginners. Mrs. Waverly introduced the teachers for each group. She called them directors. There was also an assistant director for each group. The directors for the Intermediates and Seniors led them to their tents. Then Mrs. Waverly said, "Beginners, your director will be famed stage and screen star, Sheridan Fell." "Who?" Orson whispered. "I've never heard of him." A tall, thin man stood up. He bowed slightly. Annabel hadn't been able to see him well before. Now, as the Beginners gathered around him, Annabel could finally see him clearly. His hair was long and white. His skin looked like crinkly yellow paper. He wore a red-and-white-striped shirt with long sleeves, and a red scarf around his neck. He had on loose, shiny black pants that looked like they might be pajama bottoms. "And this is your assistant director, Sandi Marshall," Mrs. Waverly said. A much younger woman in white shorts and a Camp Waverly T-shirt said, "Hi, everyone. Our tent is over there." She pointed. "Follow me." Sandi led the way across the meadow. Mr. Fell and the campers trailed after her. "He looks seriously weird," Orson whispered. Annabel thought so too. But she didn't want to say it. "Maybe he's just old-fashioned," she said. Two kids from their bus were also in Annabel's group. One was a tall girl with shiny dark hair woven into braids. The other was a thin, pale boy whose clothes looked too big for him. Under their tent was a long metal table and two rows of folding chairs. There were a pile of blue folders and a clipboard on the table. "Let's see if we're all here." Sandi picked up the clipboard and began to read names. "Lauren? Ardith? William? Sara? Annabel?" Annabel looked around as the campers raised their hands. The tall girl from her bus was Ardith, and the pale boy was William. "Melanie? Rachel? Nate? Orson?" Annabel tried to keep track of the names and faces as Sandi took attendance. "Everyone's here." She put the clipboard back on the table. "Fine!" said Mr. Fell. "And I am Sheridan Fell." He smiled. He had long white teeth. "Let's start acting," he said. "First we'll do some exercises," Mr. Fell said. "I learned these when I was a young actor in the New York Drama Workshop." "Wow," Annabel whispered to Orson. "That's a famous acting school." "I know," Orson said. "Winona McCall went there." Winona McCall was Annabel's favorite actress. "Okay, everyone." Mr. Fell raised his arms. "Let's stretch. Up, up, up." Annabel stretched her arms over her head. "You're trying to touch the sky," he said. Annabel reached toward a puffy white cloud. She imagined her body getting longer and longer. "Now dig your feet into the ground," said Mr. Fell. "You're grabbing the ground with your feet. You can feel your toes growing roots. You feel the roots go deep into the earth." A couple of the kids started to giggle. Annabel closed her eyes and pictured her toes growing roots, like a sweet potato plant in a jar. She felt her roots burrowing through the grass, down into the dirt. "You touch the sky," Mr. Fell said. "But you're still in touch with the ground." "I don't get it," the boy named Nate said. "You don't have to get it," Mr. Fell said. "Just do it." "Now I don't get it even more," said Nate. Next Mr. Fell taught them square breathing. "Breathe in to a count of four. Hold your breath to a count of four. Breathe out to a count of four." Everyone inhaled and exhaled as Mr. Fell did. "This is quite helpful to calm you down," he said. "If you're nervous, or you get stage fright, square breathing is just the right ticket." "Why do they call it square breathing?" a girl named Sara asked. "You only do three things. So why don't they call it triangle breathing?" "What a good question." Mr. Fell looked puzzled. "I have no idea." Next all the kids paired off and sat on the grass opposite their partner. "Look into each other's eyes," Mr. Fell said. "But don't say anything. You're listening. Just listening." "Listening to what?" Nate asked. "Listening to what your partner is saying." "But we're not supposed to say anything," Nate said. "That's right," said Mr. Fell. "But imagine that your partner is saying something. And listen very hard." "I don't get it again," Nate said. Ardith was Annabel's partner for the listening exercise. They sat on the ground with their legs stretched out. Annabel gazed into Ardith's eyes. For a long time they sat staring at each other, not moving. I'm listening, Annabel told herself. I'm very interested in what Ardith is saying. Just as Annabel was sure she could hear Ardith talking, she saw something moving next to her foot. It was brown. It was shiny. It was wriggling. "Gaaaah!" she screamed. "Snake! Snake!" She scooted away on her backside until she banged into Sara. He jumped up from the grass and scrambled onto the metal table. "Kill it!" he yelled. "Kill it!" "Calm down," Sandi said. "It's probably just Brownie." She peered down into the grass. "Yep," Sandi said. "It's Brownie. He's the camp snake." 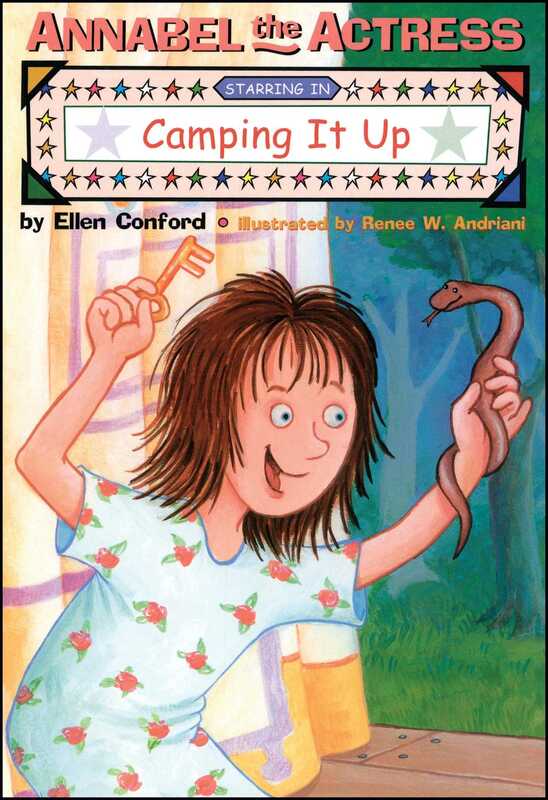 "You have a camp snake?" Orson was still standing on the table. "He's completely harmless," Sandi said. "He's here every year." "Could you take him away?" Annabel said. "Sure." Sandi picked up Brownie and held him with two hands. She carried him away from the tent toward the woods. "Why should you be afraid of him?" Mr. Fell said. "He's one of God's creatures. He's part of nature." Orson climbed down from the table. He scowled at Mr. Fell. "I hate nature," he said. When they got back to their tent after lunch, Sheridan Fell was holding the pile of blue folders that had been on the table. "Every year Camp Waverly presents A Night at the Theater," he began. "Each group performs a play." He handed out the blue folders. Annabel looked down at the white label in the center. It read children of the doomed. "This is quite a thriller," Mr. Fell said. "I think it will be very different from the plays the other groups perform." Annabel started skimming through the script. She was looking for the character who had the most lines. "Read the play tonight," Mr. Fell went on, "and choose the role you'd like to play." Annabel felt a shiver of excitement. She pictured herself acting as the most doomed child of Children of the Doomed. Maybe a famous Broadway director would come to Theater Night. Maybe the famous director would be amazed by Annabel's performance as the most doomed child. "Let's get back to work," Mr. Fell said. Annabel couldn't wait to act doomed. Annabel's parents were waiting for her at the front door when she got home. "How was camp?" they both asked at the same time. "It was great!" Annabel said. "We have a weird director, but he's nice, and we're going to do a play, and we learned how to breathe, and a snake practically crawled up my leg." "It sounds perfect," her father said. "Oh, it was!" said Annabel. While her father grilled hamburgers, Annabel read Children of the Doomed. It was about a mad scientist named Dr. Menniss who kidnapped little children and turned them into dolls. The miniature children did everything he ordered them to do. But one day they got angry about being helpless little dolls. "We must fight back!" the doll named Marjorie said. In the last scene of the play, all the doll children rushed at Dr. Menniss and pushed him into the sea. As he floated off on a rickety raft, he roared, "I WILL BE BACK!" "Wow," Annabel said. "This is very dramatic." Annabel didn't even have to finish reading Children of the Doomed before she knew what part she wanted. She told her parents the story of the play while they ate dinner. "What an odd choice for a children's play," her mother said. "Why?" Annabel asked. "Everybody in it is a child except for Dr. Menniss." "It sounds like an old horror movie," her mother said. "What's wrong with that?" Annabel's father asked. He loved horror movies. As they were cleaning up after dinner, he said, "I don't know why, but I have a sudden urge to see a horror movie." He turned to Annabel. "Want to go to the video store?" "I can't," Annabel said. "I have to tell Maggie about camp, and I have to practice for the tryouts tomorrow." Maggie was Annabel's best friend. She was very stylish and a talented designer. When Annabel became a star, Maggie would create all her costumes. Annabel ran across the front lawn to Maggie's house. Maggie opened the door before Annabel had a chance to ring the bell. "Finally!" she said. "I've been waiting for you." Annabel told her all about the first day of camp. She showed her the script of Children of the Doomed. "What part will you audition for?" Maggie asked. "I'm going to try out for Marjorie," Annabel said. "She's a very strong character. She's the leader of the doomed children." "Is she the star?" Maggie asked. "She has the most lines," Annabel said. Maggie nodded. "Then that is the part for you," she said. "Have you all chosen the roles you want to try out for?" Mr. Fell asked the next morning. "We'll start out with Dr. Menniss, the mad scientist." Orson, Nate, and Ardith tried out for Dr. Menniss. Nate read every line the same way. Loud. Ardith was very good. She squinted her eyes into little slits and made her voice screech like a rusty gate. But Orson was amazing. His voice was scary, his face was scary. He was such a believable mad scientist that Annabel got goose bumps. Next came the tryouts for Marjorie. Annabel tried hard to sound like she could lead a rebellion. But Ardith tried out for Marjorie too. She was older and taller than the rest of the kids. Her voice was deeper than Annabel's. If there was a rebellion, Annabel thought, I wouldn't follow me. I'd follow Ardith. "Now, for the role of Celia," Mr. Fell said, "I need a good screamer." Annabel jumped up. "I am an excellent screamer," she said. "I once screamed in a TV movie." "Then you have experience," Mr. Fell said. Annabel nodded. She had only been an extra, but her scream was a key part of the movie. "Okay," Mr. Fell said. "Let me hear a bloodcurdling scream." Annabel didn't even prepare. She just threw her arms up and screeched. "AIYEEEE!" Mr. Fell jumped back and grabbed the edge of the metal table. Sandi gasped. Even Orson said, "Holy crow." "That was very bloodcurdling," Mr. Fell said weakly. "Thank you," said Annabel. "Bloodcurdling screams are sort of my specialty." "I'll announce the cast this afternoon," said Mr. Fell, "after lunch." Annabel was sure that Ardith would get the part of Marjorie, but Mr. Fell hadn't asked anyone else for a bloodcurdling scream. Annabel hardly tasted her sandwich. She couldn't wait to find out what role she would play. When they got back to their tent, Mr. Fell announced the cast for Children of the Doomed. Orson would play Dr. Menniss. Ardith would play Marjorie. Annabel would be Celia. The rest of the kids would be the other doomed children. Sandi handed out yellow Hi-Liter pens. Mr. Fell told them to go through their scripts and mark all of their own lines. Orson started marking his lines. He marked a lot of lines. Annabel couldn't help feeling a little jealous. She only had thirteen lines and two bloodcurdling screams. It didn't take her long to highlight her part. When they finished marking their scripts, Mr. Fell said they would begin a read-through of the play. "Don't worry about acting," he said. "Just read your lines so we can see how the play flows." The campers began the read-through. Annabel noticed that some of them seemed to be struggling. William spoke so softly that Mr. Fell had to keep reminding him to speak up. Nate yelled all of his lines. They all sounded exactly the same. Melanie had trouble reading the words "tragedy" and "hideous." When Annabel read, she did not hold back. She screamed as loudly as she had during the tryouts. "Excellent bloodcurdling screams," Mr. Fell said. When the camp day ended at four o'clock, she was not ready to go home. The day had been too short. She wished she could stay and rehearse her screams for a few more hours. Her throat was hardly sore yet.